Buy Whole Earth Organic NoCaf 100g in the UK from our online shop or directly from our independent Scottish store. If you want to automatically receive an email when 'Whole Earth No Caf' is back in stock, just leave your email address below. Whole Earth organic no caf. Put your feet up with this organic, caffeine-free alternative to coffee, made with organic barley, ground chicory, roasted figs and malt. Ingredients: Organic barley (38%), Organic malted barley (27%), Organic chicory (23%), Organic rye, Organic figs(2%).Organic Suitable for Vegetarians and Vegans. We sell real Whole Earth and other Coffee Substitutes directly from our shop in Scotland and online throughout the UK. Where can you buy real Whole Earth No Caf safely online? If you are wondering where you can buy Whole Earth Organic NoCaf 100g safely online in the UK, then shop with us. 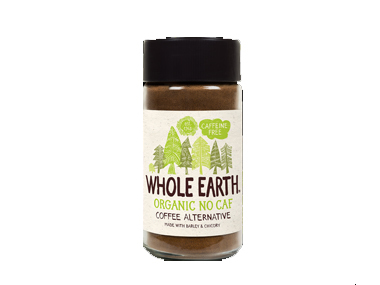 Whole Earth No Caf - Whole Earth Organic NoCaf 100g in Coffee Substitutes and Drinks.